Commissioner Farshid Joe Shooshani has been in the spotlight this week. First, a local homeowners association wrote a letter to the Beverly Hills City Council asking for his dismissal. Mr. Shooshani has privately told numerous people that he represents a specific constituency and out of those people which he refers to as “his people”, they are mostly developers. As a result, his vote is directed to their interests. Due to his predisposition, he has a disabling conflict of interest and should recuse himself from all further projects and resign immediately. Any votes he has made on projects that haven’t been ratified should be stricken and they should be resubmitted. He has also told people privately that he has to approve all projects so there can be larger houses to increase property values. This view would be okay if he wasn’t a planning commissioner. He is not supposed to have a “constituency” or advance his own political objectives through his position. This information is further grounds to support the position that he must resign or be terminated by the City Council. Mr. Shooshani typically does not know what ordinances is considering as he is chronically unprepared for Planning Commission meetings. Numerous times he is confused as to which ones he voted for and has vocally supported the paid effort by a foreign national to recall the Basement Ordinance. He equates a person who was mislead to sign a street petition by a paid signature gatherer with actual public dissatisfaction with the Basement Ordinance. Mr. Shooshani forgets the City Council voted 4-0 to enact the Basement Ordinance and he is here to enforce the laws they legislate, not vice versa. He was unaware that 800 plus signatures were struck down lack of authentication. Mr. Shooshani is not here to take political positions against the Council that he serves. He is here to enforce the laws that are enacted, not hope they are struck down. Here is a clip from the August 9, 2018 planning commission meeting where he is supporting the recall of the Basement Ordinance even though the ordinance in front of him was the Hillside Ordinance. He was totally confused as to which ordinance he was dealing with. When confronted with this sad reality, he then through out that the same people who were in favor of the Basement Ordinance were the same as the Hillside Ordinance. Use below link if you prefer actual file. The next problem arose for him at the August 23, 2018 meeting. Mr. Shooshani believed he had the right to launch an investigation into the Associations that appear before him and how they elect their officers. He also wanted to know who the members where and wanted Associations to register like lobbyists. The problem is that he as an appointed Commissioner that serves at the pleasure the City Council and that is not his function. His goal was to apparently intimidate residents who have a Constitutional right to organize and associate but yet this seemed to agitate Commissioner. He was unaware of the concept of expressive association through a group. Yet, apparently, Commissioner Shooshani withheld relevant alleged code violations and litigation relating to himself. Commissioner Shooshani according to the article failed to disclose he was a defendant in a lawsuit arising out of an alleged wrongful death for a lift he rented for an encroachment permit he obtained. The fatal traffic accident occurred on Sunset Blvd. This next segment is the footage showing Commissioner Shooshani attack a resident on an unrelated topic that was not before him. The footage speaks for itself. It was an embarrassing day for the Planning Commission that he was allowed to launch this attack. He did not present any video he was referring to nor provide any notice to the resident who was speak on a matter that had nothing to do with his comments. The exchange is dramatic and disturbing. A reprint of five star journalist Victoria Talbot’s article from the August 31, 2018 edition of the Beverly Hills Courier. Hopefully this will start a discussion to have him resign or have him terminated by the City Council. “There are facts that make Commissioner Shooshani’s removal necessary to maintain the integrity of the Planning Commission,” wrote Richards, who lists nine reasons why he should be removed, including a lawsuit arising out of an encroachment permit he took out at his West Hollywood building. The case involves an oversized JLG lift parked on the street in front of Shooshani’s Sunset Boulevard property with an expired permit, that was being used to change a jumbotron sign. The Plaintiffs are the family of a motorist killed in an early morn- ing collision with the lift. In the August 23 meeting, Shooshani first attacked the Beverly Hills Hillside Protection Association. He equated a homeowners’ association formed by residents at their own expense with lobbyists, who must register with the City if they receive $5,000 or more for the purpose of influencing City officials on development projects. “We don’t know who they are, how many people, who authorized them, are they legit- imate… they call themselves ‘president;’ who made them president?” he exclaimed at Weiss. He claimed to have spoken to the mayor and asked that such resident homeowners’ associations be placed on the agenda for the Sunshine Task Force. He wants the City to “register” them and to discern their membership and board members in the same manner as paid lobbyists, whose interests are determined by an employer. Then, citing a video of a Canadian news clip about the Loma Linda project and Francesco Aquilini, Shooshani accused Weiss of being an activist only out of self-interest, to protect her view. Weiss has catalogued more than 7,000 hours of unpaid work that ultimately resulted in the Hillside Ordinance and the subsequent Basement Ordin- ance, to keep Beverly Hills residents from having the problems found in communities like Doheny-Sunset Plaza, Sullivan Canyon, Brentwood and much of Bel Air. She has worked with residents throughout the City, sharing knowledge and experience to help others learn the lan- guage of City Hall to communi- cate effectively with government. Her selfless efforts have spawned an enlightened citi- zenry, which Shooshani has likened to lobbyists. Their organization is not unlike the Trousdale Homeowners, the Beverly Hills North Homeowners, or the Southwest Homeowners’ Association. Those organiza- tions have unnamed member- ship, informal leadership proceedings and in each case, the same person has led the organ- ization for decades without dispute. 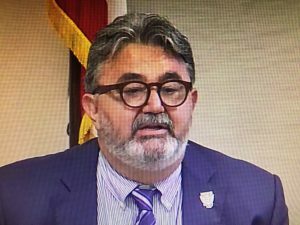 Weiss had come to the meeting to address the Commission regarding personal attacks and a lack of civility at the Aug. 9 meeting when res- ident Byron Allen disparaged Commissioner Peter Ostroff, Debbie Weiss and Ronald Richards. Despite his barrage of attacks, his Calle Vista project will progress out of the com- mission with a 3-2 approval, though it is located on a street that is less then 24 feet wide and where there will be over 6,000 cubic yards of export, mostly bedrock. That is more than four times the current limit for the street, and more than twice the limit city-wide. Allen criticized neighbors who opposed the project and gathered signatures. Allen told Commissioner Ostroff, who could not make the findings to approve the project, that he should “recuse himself,” because he did not have an open mind. Chair Andy Licht allowed Allen to continue to speak for nearly 45 minutes before allowing Weiss only a 2-minute rebuttal, though she had a for- mal presentation and represented at least four neighbors in the audience and over 100 people who had signed a peti- tion opposing Calle Vista. In March, Shooshani led a 21- minute rebuke of then- Chair Lori Greene Gordon, for allegedly not supporting the com- mission decision at a City Council meeting to approve the Basement Ordinance. At that time Shooshani expressed outrage that the City Council did not accept the ordinance as the Planning Commission presented it to them, which would have allowed all the pipeline projects to go through under the old rules. At that time Shooshani expressed outrage that the City Council did not accept the ordinance as the Planning Commission presented it to them, which would have allowed all the pipeline without further consideration. “This is a slap in our face,” he said, overestimating the Commission’s authority. It is difficult to discern what Gordon said that could be construed as undermining the commission’s decision. “I want to encourage you to accept the ordinance as written… You have expressed extreme confidence. I want you to have the same confidence in our ability to judge these cases fairly,” where her words. Commissioners are selected by the City Council from applicants who apply for the open seats. They serve at the behest of the council and can be removed from office at any time with a majority vote of the council. They are advisory, though the Planning Commission, Design Review and Architectural Commissions make final decisions that can be called up or appealed at the council level. Richards contends that in deliberations, Shooshani shows “a repeated lack of analysis to determine required findings… and a failure to uphold the General Plan.” Shooshani has said on at least two occasions that he doesn’t support the General Plan because he feels it is out of date. On both occasions, the commission was deliberating the Friars Club project, a mixed-use condominium project that will require a zone change to complete. Shooshani has openly expressed interest in having his children live in the condominium. Richards also accuses Shooshani of “failing to prepare in advance of meetings,” citing several instances where he says the commissioner demonstrated a lack of familiarity with an agenda item or confused items repeatedly. Evidently, “civility” seems to be in short supply in the Planning Commission. “At the Aug. 23 meeting he directed the City Attorney to create an unconstitutional… litmus test as to which organizations are ‘legitimate,” wrote Richards, citing NAACP v. Alabama (1958), in which “dis- closure of affiliation with groups engaged in advocacy may constitute… restraint on freedom of association,” and he says such inquiries infringe on the right of freedom of expression guaranteed in the First Amendment of the US Constitution. “Shooshani’s inquiry and implied threats of disclosure are attempts to intimidate expressive association in front of his Commission… We are residents who help bring about profound change and will continue to bring change to what was a series of policies and laws which were jeopardizing the Beverly Hills hillsides,” Richards said.